Mindfulness is the energy of being aware and awake to the present moment. It is the continuous practice of touching life deeply in every moment of daily life. 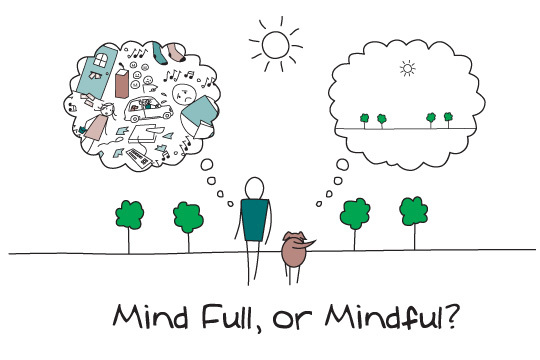 To be mindful is to be truly alive, present and at one with those around you and with what you are doing. We bring our body and mind into harmony while we wash the dishes, drive the car or take our morning shower. Here in Plum Village, we do very much the same things as when we are at home- walking, sitting, working, eating, etc.- except now we learn to do them with mindfulness, with an awareness that we are doing it. We practice mindfulness throughout every moment of the day and not just in the meditation hall, but also in the kitchen, the toilet, in our rooms and on the path leading from one place to another. In practicing together as a Sangha, as a community, our practice of mindfulness becomes more joyful, relaxed and steady. We are bells of mindfulness for each other, supporting and reminding each other along the path of practice. With the support of the community, we can practice to cultivate peace and joy within and around us, as a gift for all of those whom we love and care for. We can cultivate our solidity and freedom – solid in our deepest aspiration and free from our fears, misunderstandings and our suffering. Dear friends, let us try to be intelligent and skillful in our practice, approaching every aspect of the practice with curiosity and a sense of search. Let us practice with understanding and not just for the form and appearance. Enjoy your practice here with a relaxed and gentle attitude, with an open mind and receptive heart.